New US animated series Star Wars Rebels premieres in Australia today following the feature-length Spark of Rebellion two weeks ago. The series is created by Dave Filoni (Star Wars: The Clone Wars), Simon Kinberg (X-Men: Days of Future Past, Sherlock Holmes), and Carrie Beck. 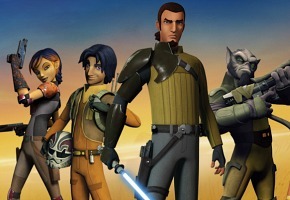 The Lucasfilm Animation production is also executive-produced by Filoni and Kinberg as well as Greg Weisman (Gargoyles). Set between the events of Star Wars Episodes III and IV, the story unfolds during a dark time when the evil Galactic Empire is tightening its grip of power on the galaxy. Imperial forces have occupied a remote planet and are ruining the lives of its people. The motley but clever crew of the starship Ghost — cowboy Jedi Kanan, ace pilot Hera, street-smart teenager Ezra, the “muscle” Zeb, warrior firebrand Sabine, and cantankerous old astromech droid Chopper — is among a select few who are brave enough to stand against the Empire. Together, they will face threatening new villains, encounter colorful adversaries, embark on thrilling adventures and become heroes with the power to ignite a rebellion. Friday 17 October at 6pm on Disney XD. 7Mate is repeating Spark of Rebellion this Friday at 4.30pm. I, sadly, can’t see any sign of the rest of the series on FTA. Did they just want to get the kids hooked? It worked with my children. I heard this was actually good. Anyone seen it? Some of the clips looked a bit kiddy with the robots. @oceanographer- unlikely, as SW:R is a Disney property. Thanks @Mr_AJ – I caught it by accident while channel surfing. One of those “Blink and miss it” time slots. I’m assuming it will be on ABC3 sometime in the future. @ Matt F, indeed it was Spark of Rebellion. Still waiting for 7Mate to schedule the rest of the season. What did 7Mate show last weekend? Was that Spark Of Rebellion?